Revell has re-released their vintage WWII Gato Class Submarine in enormous 1/72 scale - topping off at just over 52 inches in length! Surface detail of the deck and fittings is excellent, as well as their renderings of the 20mm, 40mm, and 4inch deck armament. Also included are three sets of pre-bent, steel wire steps as well as a variety of pre-drilled stanchions for stringing safety cabling. Overshadowing everything, however, is simply the sheer size of the hull - an ambitious project for any modeler. The United States Navy Gato-class was the first mass-produced US submarine class of World War II. Together with the Balao and Tench classes, their design formed the majority of the United States Navy's World War II submarine fleet. The subject of this review is the U.S.S Drum (SS-228), named after the Drum fish, known for their ability to make a drumming sound. Drum is on display as a museum ship in Mobile, Alabama, at Battleship Memorial Park. She was laid down on 11 September 1940 at Portsmouth Naval Shipyard, Kittery, Maine, launched on 12 May 1941, and commissioned on 1 November 1941, with Commander Robert H. Rice in command. The first thing you notice opening the box is the great job Revell has done in packaging everything, and designing the model to minimize exposed seams. 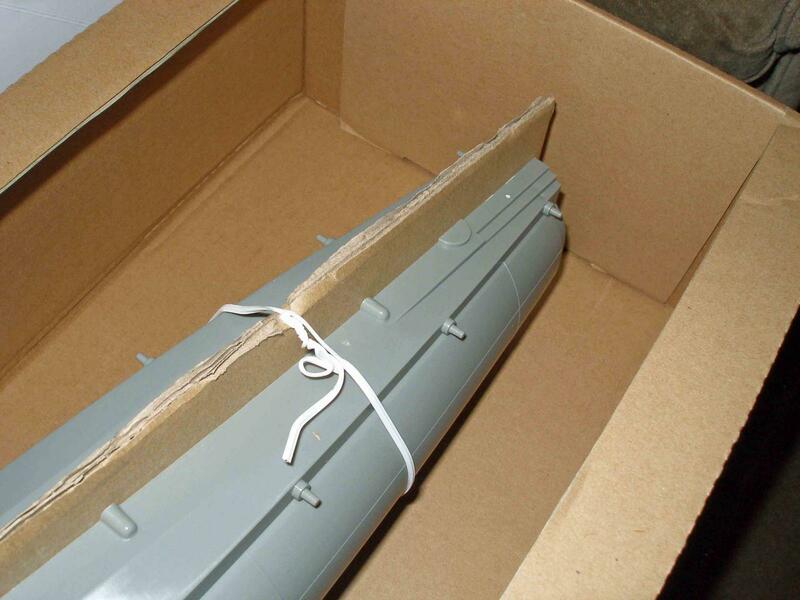 The two halves of the hull (split down the middle) are sandwiched around a thick piece of cardboard, while the single piece bow and stern sections are packaged separately, as are the three deck sections that cover the seam down the middle of the hull. The contents in the enormous box are compact just enough to keep these large parts from damaging the smaller parts on individual sprues. And speaking of sprues, a model of this size requires some structure, and many of the sprue connections are massive, yet Revell made sure that the smaller, delicate parts have tiny connection points that are easily snipped and cleaned. 1 bag of single ply black nylon thread used for antenna wire and rigging. The instructions include a handy, four-page parts list with the proper nautical names to help those of us not used to terms like 'Breech Caps' 'Sight Trim Boxes'. Most steps contain simple images with notes scattered here and there to assist when needed. The parts count is relatively low, so Revell kept things pretty simple. One issue I had was the lack of sprue letters, which forced me to look over all nine sprues for a lot of the smaller pieces identified (with letters!) in the instructions. With the Gato, you will need a lot of clamps and a lot of room. You should also think about starting with a full bottle of glue - I found that Testors 'Black Bottle' liquid cement was the only product up to the task. It's slow drying time and the solid bond after drying was critical to bringing some of the larger and more cumbersome parts to heel. Since no two Gato-class submarines were exactly alike, Revell gives you several options as far as placement of the deck weaponry and other significant detail. Study the boat you want to build so you can decide which holes to open up and where you want to place the guns, etc. The instructions begin with attaching a bilge keel to each side of the main hull, but I would suggest that you attach these after putting the two halves of the hull together. Doing so will allow you to use any and all means available to clamp the two halves together while the glue is drying. I followed the instructions and the two keels got in the way of applying pressure to the center portion of the hull - meaning I had to hold the halves together by hand for about 30 minutes, while very wide and strong rubber bands held the rest of the hull. The two halves of the hull are brought together with the assistance of eighteen plastic pins and two large support bulkheads - a thoughtful, and key - design. Engineering the pins separately allowed the hull halves to be ever-so-slightly manipulated while the glue was drying - a big plus since you cannot 'see' all the angles and sides of the hull at the same time in this scale. Each keel has five round ejection pin holes that should be removed before being attached. Fortunately, the round marks are of the 'outee' variety and can simply be sanded away. The two troughs that the keels fit into are slightly larger than they need to be, and could benefit from a little putty to close things up. The instructions provide a nice diagram for the angle of each keel. Slide the Bow Plane Strut (Parts 24) into the upper bow plane so that the part that fits into the hull faces forward, not aft as in the instructions.Facing it aft causes it to be visible through the limber holes. Glue (only) the top bow plane onto the hull attachment point (Part 23), fitting the Strut into the hole just above it. Once that is on, put plenty of glue on the bottom bow plane and attach it to the top bow plane from underneath.Clamp the two planes together to get a good seal. Part 29 (Rear torpedo tube door bulkhead) has several large sprue-ejection marks - these are not visible when in place. Make sure to remove the 'Revell/2006 Made in China' raised lettering on the aft sail plane (Part 25). I'm pretty sure that wasn't part of any USN Measure scheme! The propeller guards in Step 8 could have been a headache to bring together, but Revell chose to offer a simplified design that made the job a snap. Keep the parts in order and everything fits perfectly as shown. Good job, Revell. Attaching the three parts of the main deck was a significant challenge for me. I stand 6'3" tall with a proportionate 'wing span', yet I could not find a way to see my way around the hull while attaching the deck. I couldn't exactly pick it up and flip it back and forth check things, so to speak. As a consequence, I had larger gaps than I would have liked where the pieces met the main hull halves, and I had to guess at the angle of the deck since the center section seemed to rock slightly from port to starboard when being glued down. I'm sure that a judge could find something wrong, but in the end things worked out well enough for me. Considering the task at hand, I think Revell did a pretty good job getting things to fit overall. Once the deck and hull were dry, I settled down to a full modeling session just adding Perfect Plastic Putty to all the cracks and seams that aren't supposed to be there, leaving behind those that were. There is a significant seam down the middle of the top of the conning tower that will have to be worked out since it is plainly visible on the completed model, especially if you put figures there to attract the eye. The two crossbars that wrap around the front of conning tower (Parts 91) weren't even close to being long enough for the job, even if I bent the two railings they are supposed to bring together, inwards. I ended up leaving them off. The ladder provided in the kit does not fit between the rear deck locker tube and the top of the tower, as shown in the image in Step 17. Also, the railings around the rear deck do not fit well at all - I had to bridge the gaps between the rear railing section and both sides with thick glue, applied over several sessions. The design of the connections between the three rail sections could have been improved here. All three weapons were pretty basic affairs. That said, after painting these I'm not sure aftermarket replacements would have looked that much different. It is a big submarine... but still 1/72nd scale - meaning the detail is still pretty darn small. The 20 mm Oerlikon cannon is made up of seven parts, including a four-part stand, but it requires a lot of clean up for flash and a significant (and visible) sinkhole on my copy. I replaced the clear plastic sight with a photoetch version from my spares box on both the Oerlikon and the 40mm Bofors gun. I didn't like the look of the plugged up barrel on the 4-inch deck gun, so I left off the end and hollowed out the barrel. My model, my rules. Once all the detail was good and dry, I went about adding the rigging. Revell provides the parts to string cables around the forward end of the conning tower, down both sides of the center deck section, and around the forward stairwell. In addition, antenna can be strung from the conning tower aft, on both sides. 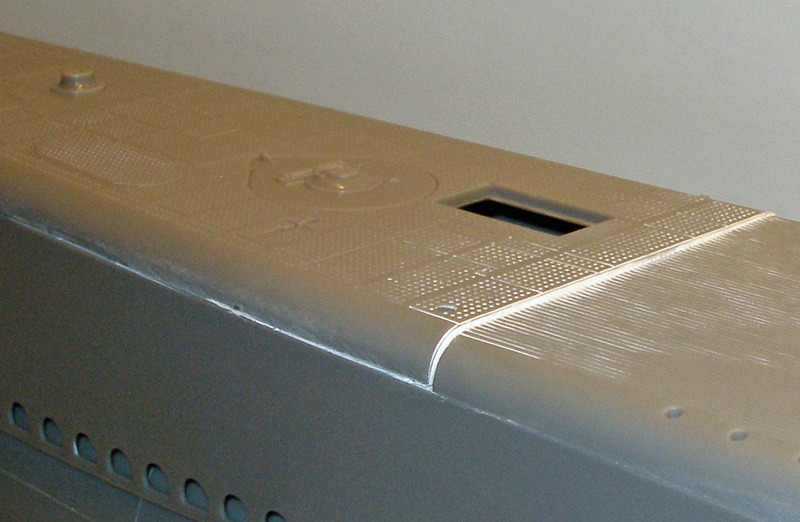 The stanchions provided are pre-drilled and reasonably robust - sturdy enough to handle a little tension, but not much. In the end, unless you replace everything with brass secured with epoxy, the lines will relax and sag a little. I thought the nylon line provided in the kit was too thin and the wrong color for cabling, but satisfactory for the antenna wire (although too glossy, as packaged). I decided to open up the stanchion holes a little and substitute the nylon thread with slightly heavier, single-wound cotton thread for the safety cables. In Steps 26 and 28, the illustrations showing Part 38 is either wrong (reversed) or the plastic parts are incorrect. The hole for the rigging is supposed to be forward, not aft. You don't discover this, however, until you are getting ready to rig the lines. There is no information about rigging the antenna wire except for the picture of the finished boat. The way I see it, submarine models are all about paint and finish, since, apart from the conning tower, there is (relatively) little other significant detail to be found. Many times I have marveled at the exquisite weathering applied on some WWII submarines at shows and, coming from an armor background where weathering reigns supreme, I couldn't wait to get to this part of the build. 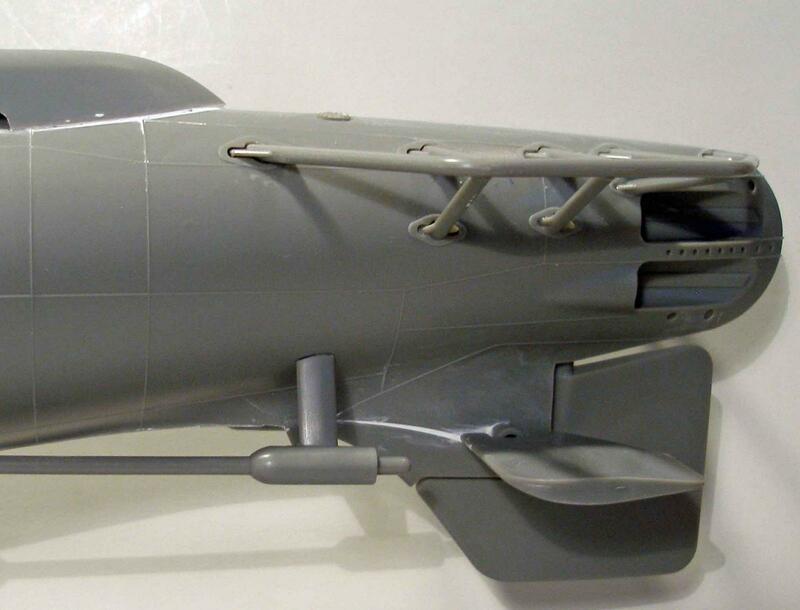 Looking over a number of references and photos that I found online, I quickly came to the conclusion that there were no two Gato submarines much alike, or actually even close. Two basic color schemes, however, seemed to bubble to the top: all black, and a two-tone black/light grey. While enthusiasts might want to pour over reams of official Navy documentation on the different USN Measures used during WWII, I thought instead I would invoke a little artistic license and use a variation of the Black/Grey scheme, heavily weathered after a long war patrol. I also wanted to break the rules and put designation numbers on my conning tower (even though this would not have been accurate for submarines on patrol). My goal was to add as much interest to the otherwise monotonous finish as I could - without painting the submarine pink! I started with priming the conning tower (and all the items that would end up being light grey) with Alclad Black Primer & Microfiller. This primer is tough, very easy to use, and very thin. The dark primer fills in the recesses and provides the shadows near the flat surface edges, adding depth to the subsequent coats to come. I following this with Tamiya NATO Black on the areas of the conning tower that would remain black - giving these areas a slightly lighter, greyer tone. I then masked off the (NATO black) areas to protect them from the light grey color coming next. For the light gray, I used Model Master Enamel 5-L Light Grey (USN), which differentiates itself from 'Haze Grey' by containing a slightly bluish tint. When applying the grey paint, I made sure to let some of the primer coat show though. Once this was dry, I went back and carefully sprayed NATO Black on all upper surfaces of the guns and stanchions and any other significant part, using period photos as a guide. The broom signifying a 'Clean Sweep' patrol was painted using Vallejo PA New Wood and Model Master Afrika DunkelGrau. I painted the propellers and bell with Alclad Pale Burnt Metal over Alclad Black Primer and the stand Alclad Black Primer and Tamiya XF-9 Hull Red. I picked up a set of CMK 1/72nd scale figures (#F72175) to place on the bridge to give the viewer a sense of scale. These nicely detailed resin figures comes with detached heads and arms that allow you to position them the way you want, although they seem to be a little small for the scale (or the conning tower railing is a little high). I placed small blocks of styrene under the Captain and XO to bring them up a little from the deck. After priming with Alclad Grey Primer with Microfiller, the figures were hand-painted using variations of Vallejo Model Air Blue (71.414) and White, along with Leather, Skin Tone, and Saddle Brown. Once dry, the figures received a wash of Mig Wash Brown oil paint. I applied Future floor polish* to the sides of the conning tower that would receive decals by hand. Once the Future was dry, I applied the decals using the Red and Blue Micro Sol/Set system without any problems. I then laid down another coat of Future over the entire conning tower, guns, and grey detail to seal the decals and prepare the other surfaces for weathering. (*) Future is now sold as 'Pledge Multi-Surface Floor Finish' and 'Pledge Tile & Vinyl Floor Finish with Future Shine' as well as 'Pledge Floor Care Multi-Surface Finish'.The manufacturer says the formula is identical to the old Future, regardless of the name.I've had my 27oz bottle of Future for 25 years, and still use it regularly. Painting the main hull was a challenge. I custom-built my large spray booth to be able to handle Monogram's 1/48th scale B-29 on a turntable, with room to spare, and this submarine dwarfs even that. Luckily, most of what I needed to do was with a rattlecan, so I managed to fit everything else into a pair of airbrush sessions in my garage, with a night in between. I first went out to the driveway, set up a large piece of cardboard on a trash can, set the main hull on the (still un-painted) stand and sprayed the entire hull with Tamiya AS-3 Grey Green. I felt this color best represents faded black, taking 'scale effect' into consideration. I moved the hull back and forth on the stand so I could make sure to get everything painted, although I knew any flaws in the finish could be hidden by weathering in the end. This color would suffice for the pressure hull, outer hull, and the steel portion of the decks. It is also dark enough to serve as a pre-shade for the areas that would be painted light grey. I then went over the steel and teak decking on top of the boat with Tamiya (rattlecan) XF-1 Flat Black. Once everything had out-gassed, I brought the hull back inside and masked off the teak-wood center section, and the upper pressure hull so the light grey areas on the hull sides could be airbrushed safely. I then moved a table, chair, two lamps, Co2 tank, airbrush and all the required supplies out to my garage, banishing our cars into the wild January elements - the things we do for modeling. I first dusted the fore and aft steel deck sections with Model Master Steel. This would serve as a base for weathering and to differentiate these areas from the darker center section. I then loaded up the Model Master 5-L paint and sprayed the light grey areas, allowing some of the pre-shade dark grey to show through, especially along the weld lines and deck edges. Once those areas looked decent I added a short section of White Ensign Models Haze Grey to each side, aft of the 5-L sections. On many of the photographs I studied I found that there were significant salt-water marks on the pressure hull, especially on the areas that remained underwater while the submarine was patrolling on the surface. I wanted to bring those areas out a little, so I loaded up Tamiya Liquid Surface Primer (my go-to White paint) and cut it 50/50 with Gunze Leveling Thinner. I then spent the next 90 minutes outlining the steel hull sections along the raised weld-lines. I also dusted these sections with white, making sure to keep everything below the 'waterline'. In the end, these areas will be weathered much more than the areas that were exposed on the surface. I let this out-gas, and then gave the hull a thorough coat of rattlecan Tamiya TS-13 Clear to give the surface a smooth, glossy finish. The entire submarine was now painted and ready for final assembly and weathering. This step would make or break the build. Relying on my experience with armor models, and several photos from the internet, I went about bringing a little 'life' into my three-dimensional canvas. I started with the Conning Tower, which had a gloss finish over the decals. Using heavily diluted Mig Wash Brown, I gave the entire tower and guns a couple of filter layers, sopping up excess wash as I went. I followed this with a diluted pin wash using Mig Dark Wash (aka Raw Umber), paying special attention to the protruding and recessed detail. While I had the wash handy I hit the main deck hatches and the 4-inch gun mount. I would hit these same areas with each successive step, building up the layers as I go. Staying with the 'browning' theme, I diluted some AK Interactive Rust Streaks and streaked it vertically down the sides of the tower starting each streak from some protruding surface detail. I then went around the upper sides of the hull (the areas that are exposed when the submarine is on the surface), and used a new product to add streaking here and there; Humbrol Enamel White Wash, heavily diluted with AK Interactive White Spirit. Once satisfied, I addressed the lower hull using a pin wash of AK Interactive Rust Streaks, focusing on the raised weld lines and other detail. While I'm not sure rust actually forms under water (?) I liked the look it gave the submarine... dark, worn, beat up. The last step was to hit the shiny areas with Tamiya rattlecan Clear Flat. This boat was done and done. What can I say? This is a big model. It takes a lot of glue, paint, and space. What it doesn't take is a lot of time. Revell did an excellent job of keeping the parts count down, while still delivering the all-important 'wow' factor. There are flaws and missing detail, and without aftermarket interior spaces, it's not a model for purists. Instead, this kit should be built with the mindset of just creating something really cool - it's great to see something so massive come together. From a finishing standpoint, this build required me to solve a lot of new problems, and I feel that I'm a better modeler for the experience. If you've got the space and a serious budget for paint, I recommend this kit for all modelers, young and old. There are no significant fit problems and assembly is a breeze. I would like to thank Revell / Monogram for providing this kit for review, and to IPMS USA for giving me the opportunity to build it. Submitted by Mark Gatton (not verified) on Mon, 2019-04-01 23:27. Seriously? $119.95?! Is it made of gold? This model new is about $20 at Hobby Lobby or on Revell's website. Submitted by IPMS/USA Webmaster on Tue, 2019-04-02 08:54. This is the 72nd scale Gato Sub. It's 52" long and going for over $100 on eBay as its is out of production.